This book explores themes within the Christmas story through National Curriculum subjects such as art and design, design and technology, geography and history, science, maths, drama and literacy. It gives ideas for assemblies as well as individual class activities. The clean design with an easy-to-use format combines storytelling with core literacy and numeracy activities. It includes an easy-to-perform Advent play. It is suitable for primary school teachers working with 7-11s (KS 2), as well as to clergy and children's work leaders with primary school links leading assemblies. This book contains a wealth of ideas for cross-curricular teaching designed to give a host of fresh ideas for the last few weeks of the Christmas term. The material includes a mix of practical, literary and academic tasks, all linked to the National Curriculum and comes complete with a nativity play and three structured literacy hours, based around a specially written story "The Last Customers". There are also ideas for Advent assemblies, drama workshops and things to make, including a class Advent calendar, Advent candles and St Nicholas Day biscuits. The material includes class worksheets with full photocopy permission where appropriate. 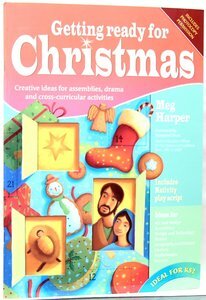 About "Getting Ready For Christmas"
MEG HARPER, author of the My Mum series (now in their second edition), No More School and Cyberpest. As well as writing fiction Margaret is studying to teach drama.